January saw what they had hoped to be a season pushing for the National League South play-offs transformed into a potential title chase. They did it with some stellar performances, especially at Twerton Park where Jerry Gill’s side fused style, grit and passion into nine fantastic points. They not only toppled leaders Torquay United – on a ten game winning run at the time of course – but they thrashed rivals Chippenham Town 5-0 and also edged out tricky East Thurrock United. They weren’t bad away from home, either. Useful points and clean sheets were collected at Slough Town and Gloucester City, and a solid 2-0 win at Dulwich Hamlet kept them in the hunt. They only let in goals in one game, so strong was their together backline. 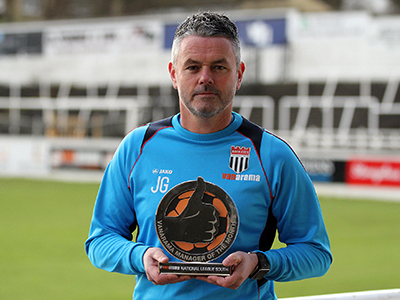 Gill was a richly deserved recipient of the Manager of the Month accolade and the Club’s supporters are wondering what the final three months of the season could have in store for them.